Advanced calibration document for the MDX-540 4th axis. Advanced calibration guide for the ZCL-540 4th axis accessory (Spanish version). User's manual for the ZCL-540 rotary axis unit. MDX-540 Manual del Usuario. MDX-540 User's Manual, Espanol. User and application manual for the ZTT-540 t-slot table accessory (Spanish version). Setup and application guide for the ZTT-540 t-slot table accessory for the MDX-540. This is the fan that can be installed on your MDX-540A or MDX-540SA tool holder to blow chips away from the cutting surface. 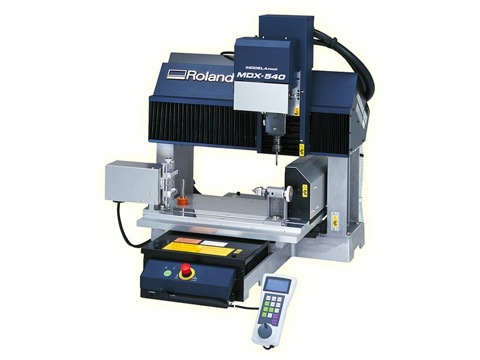 This guide will help you setup your MDX-540 for 3 or 4 axis use. Always refer to owners manual for more in depth details. Step by step installation for Roland Pixform Pro II software and operational instructions. The following is the software package for Virtual Modela v1.71. This is updater for VPanel for MODELA PROII. Previous version of VPanel must be installed in order for the updater to work. The following document discusses the cause of excessive Z-Axis movements or the MDX-540 machine moving to the very top and appearing to continue to cut in the up position. The standard milling area of the ZCL-540 is meant to prevent the spindle or tool from colliging with the ZCL-540 Rotary Axis Unit. This document will demonstrate how to disable this safety are. If the MDX-540 series of machines is having trouble detecting the Z-origin process, a bad contact or break in the Z-origin detection process could be at fault. If a tool holder is stuck in the automatic tool changer, this document discusses how to remove the stck tool holder. It also discusses preventative maintenance for the tool holders. ​Firmware must be installed using this method on older machines using serial or parallel ports. Where can I find the dimensions for the ZTT-540 T-Slot accessory? MDX-540 making abnormal noise in spindle unit while running. ​Work piece is not raised high enough to be milled when using the MDX-540 T slot table (ZZTT-540). "Start Cutting" is not available to output the file to ether the mill or to a file.